Pyrenula cruenta, copyright Gary Perlmutter. There is no denying that the advent of molecular phylogenetic analysis has been a boon for fungal systematics. It has allowed a much greater resolution of relationships than was previously possible (especially for comparisons between asexually- and sexually-reproducing fungi), and has even lead to the identification of a number of major lineages that probably could have never been recognised from morphological data alone. One such lineage is the Chaetothyriomycetidae, whose members vary from lichens on tropical tree trunks, to saprobes living in the deep sea, to pathogens in the brains of humans. The Chaetothyriomycetidae (or Chaetothyriomycetes in many older references: the botanical code goes rather all out in the rather irritating practice of changing the endings of names to indicate arbitrary taxonomic ranks) has been divided by Gueidan et al. (2014) into four major lineages. Two of these, the Pyrenulales and Verrucariaceae, are mostly comprised of lichens. Lichenised fungi in the Pyrenulales associate with green algae of the family Trentopohliaceae (which, despite being 'green algae', are generally orange in colour), and are most commonly found on tree bark in tropical forests. Only one lichenised genus, Strigula, is also found growing on leaves; non-lichenised Pyrenulales are found on bark, leaves or wood (Geiser et al. 2006). 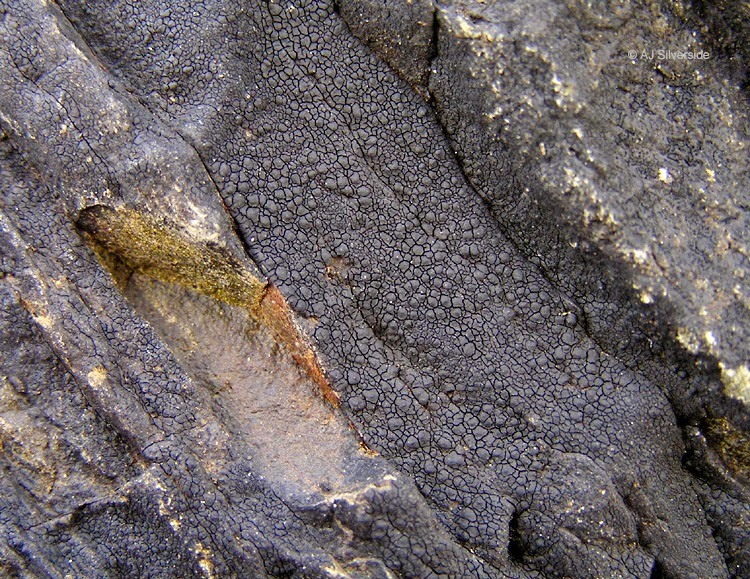 Verrucaria maura on coastal rocks, copyright A. J. Silverside. The Verrucariaceae, in contrast, associate with different symbiotic algae, and prefer to grow on rocks. Lichens of this family are often blackish; their hyphae are darkened by a melanin-like compound which allows them to tolerate quite exposed conditions. Certain species are particularly prominent around the marine shoreline. Gueidan et al. (2014) also identified a small as-yet-unnamed lineage close to Verrucariaceae including rock-dwelling and moss-associated non-lichenised fungi, but support for this grouping requires further testing. Another somewhat novel lineage identified by Gueidan et al. (2014) was the Celotheliaceae. The type genus, Celothelium, is a lichenised fungus that associates with the alga Trentepohlia in the manner of Pyrenulaceae. Other members of the Celotheliaceae, however, are quite different in ecology, being mostly pathogens of woody plants. Phaeomoniella chlamydospora is a causative agent of grapevine trunk disease, resulting in conditions such as esca, and the rather ominously named 'black goo decline' (so-called because the stems become filled with 'black goo', as the xylem vessels become clogged with fungal hyphae). 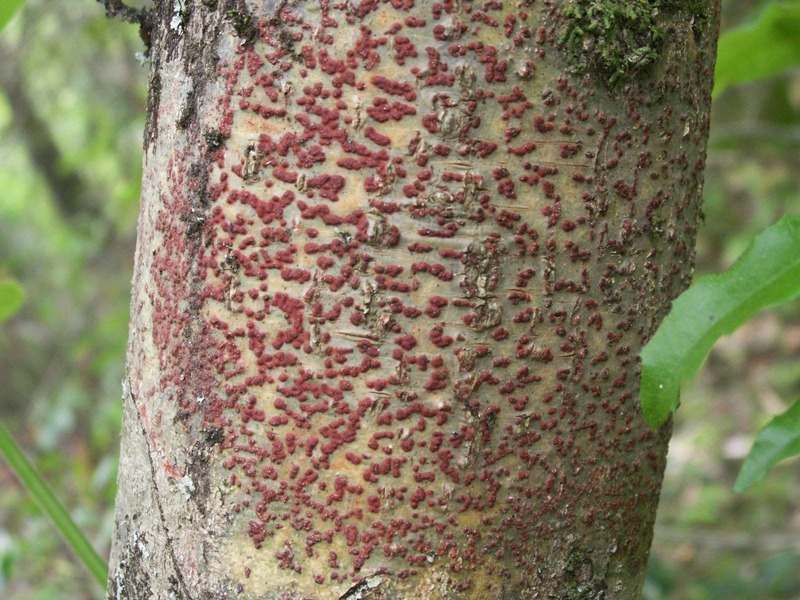 Dolabra nepheliae causes canker in lychee and rambutan trees. These pathogenic taxa are commonly largely anamorphic (that is, they produce asexual reproductive structures). 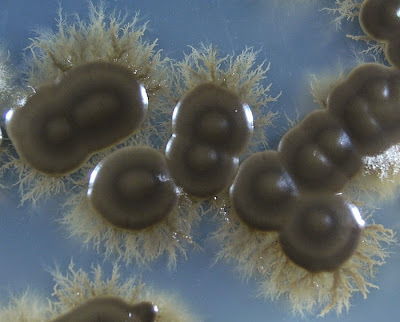 Culture of black yeast Exophiala dermatitidis, from here. The last and most diverse lineage (so far as we know, anyway) is the Chaetothyriales. Like the Verrucariaceae, the Chaetothyriales have melanised hyphae and often grow on exposed substrates such as rocks. Indeed, molecular analyses have supported a closer relationship between Verrucariaceae and Chaetothyriales than the other major lineages. However, members of the Chaetothyriales are not lichenised. 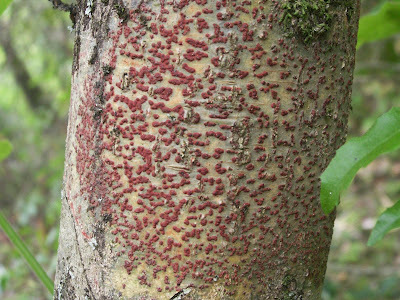 Many are saprobic; others, such as the Chaetothyriaceae, grow on plant leaves but in many cases it is unclear whether they are saprobic or parasitic. The mostly saprobic family Herpotrichiellaceae also includes a number of asexually-reproducing forms that grow as yeasts and are opportunistic pathogens, including in humans. Infections by black yeasts (Exophiala) are most commonly cutaneous and relatively superficial, but they can also cause severe and life-threatening infections of deeper organ systems. These infections are most common in patients with pre-existing conditions affecting the immune system, but at least one species, E. dermatitidis, has been recorded causing fatal brain infections in otherwise healthy individuals. And I referred at the beginning of this post to the deep sea? Well, the Chaetothyriomycetidae samples from there are, I believe, yet to be described. It is possible that this diverse group of fungi still has surprises for us. Geiser, D. M., C. Gueidan, J. Miadlikowska, F. Lutzoni, F. Kauff, V. Hofstetter, E. Fraker, C. L. Schoch, L. Tibell, W. A. Untereiner & A. Aptroot. 2006. Eurotiomycetes: Eurotiomycetidae and Chaetothyriomycetidae. Mycologia 98 (6): 1053-1064. Gueidan, C., A. Aptroot, M. E. da Silva Cáceres, H. Badali & S. Stenroos. 2014. A reappraisal of orders and families within the subclass Chaetothyriomycetidae (Eurotiomycetes, Ascomycota). Mycol. Progress 13: 1027-1039. Do we have any idea how old (crown) Chaetothyriomycetidae are? Haven't the foggiest. There is a fungal fossil record out there, but I have no idea how extensive it is or how informative.